Mirjana Markovic shown during a parliament session in Belgrade on Oct. 24, 2001. 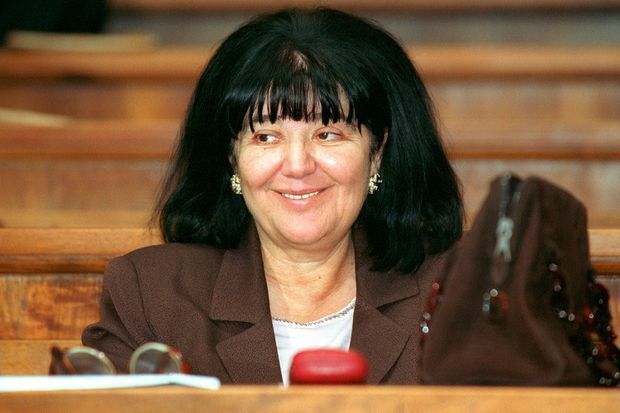 Mirjana Markovic, the widow of Serbian strongman Slobodan Milosevic who played a key role in her husband’s policies during the violent breakup of Yugoslavia in the 1990s, has died in Russia at the age of 76, state-run RTS TV reported. Ms. Markovic, seen by critics as a Lady Macbeth figure goading her husband on to crush his enemies and defy the West, died in a hospital in Moscow, where she had lived in exile since fleeing Serbia in 2003 to evade prosecution on abuse of office charges. A family friend, Dragoljub Kocovic, said Ms. Markovic had died of complications related to pneumonia. No other details were immediately available. “I hope she will find the peace that people took away from her,” state TV quoted Mr. Vulin as saying. Serbian Foreign Minister Ivica Dacic, head of the Socialist Party that Mr. Milosevic led in the 1990s, also sent condolences to her family and offered the party’s help in organizing Ms. Markovic’s funeral, state TV said. “Maybe we did not always share the same views … but I respected her as Slobodan Milosevic’s wife and as a scientist,” Mr. Dacic said. Ms. Markovic, a former sociology professor at Belgrade University, was a close political confidante of her husband, who swept to power on a wave of Serbian nationalism in 1990. She stood by him during the bloody breakup of Yugoslavia and the North Atlantic Treaty Organization’s 1999 aerial bombing campaign that aimed to end Serbian forces’ crackdown on ethnic Albanian separatists in the Serbian province of Kosovo. Mr. Milosevic lost power in 2000 in a popular uprising and was extradited to The Hague a year later to face war crimes charges. He was found dead in his cell in The Hague on March 11, 2006. In her diaries, published in the then pro-government newspapers in the 1990s, she would often predict Mr. Milosevic’s future moves. Ms. Markovic was born on July 23, 1942, the daughter of communist partisans fighting the Nazi occupation of Yugoslavia. Ms. Markovic and Mr. Milosevic were childhood sweethearts and became inseparable. Though she owed her political influence to her role as his closest adviser and confidante, she also built up her own power base in the neo-communist Yugoslav United Left. She did not return from her Russian exile to attend Mr. Milosevic’s funeral in Serbia for fear of being arrested, both on charges of having abused her position as first lady to procure apartments for family members and on suspicion of possible involvement in the 1999 death of a newspaper editor. Ms. Markovic leaves her son Marko and daughter Marija.